The Doobie Brothers, one of the most commercially-successful bands of the 1970s, finally see their eight first albums reissued and remastered with bonus tracks for the first time through Edsel Records under licence from Rhino Records. Gathered in the form of four double cd's (each sold for the price of less than one !! ), these albums are essential classic rock and will please every R'B, rock, country and folk music fans. Last edited by Sergey : 2011-11-19 at 00:43. They may look stupid at first sight, but this was it was like back in the 70's. And yes, double drummers was something typical at that time, you also find that with the Allman Brothers Band. Two complementary drummers to fill all the gaps in the rhythm section. You have to listen more of the Doobies, they later joined forces with cult horn section Tower Of Power. And not to forget the vocals, something we kinda lost at the present time. 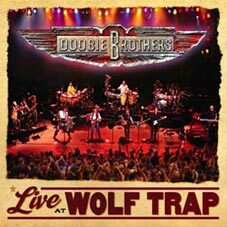 A live album out on Eagle Records called : Live at Wolf Trap is a great example of the Doobies on stage. Another live is just out on Eagle also : Live at Greek Theatre 1982.